“Ah, Woodrow, just what we need—a spot of whiskey before the ghost comes!" With its release in 1944, The Girl Who Dared wasn’t nearly the first movie to sound like a slasher movie to our contemporary ears; after all, films had been gathering casts to be stalked by unseen psychos for nearly two decades at that point. And at the risk of sounding reductive, let’s just say that (with a few notable exceptions) the 40s were a bit of a black hole for the genre as far as real ingenuity goes, so the decade was mostly content with polishing up familiar tropes. That just happened to be the M.O. of Republic Pictures, the uber-Poverty Row studio that churned out hordes of B-movies during its existence. Having seen more than a few of these at this point, it’s become obvious that Republic was quite committed to this niche—while none (save for perhaps The Vampire’s Ghost) qualify as buried gems, each has been a solid take on familiar stuff. The Girl Who Dared continues in that vein, as it’s an efficient little Old Dark House number that packs nearly every conceit of the genre with very little of the fat. It begins with a supernatural one: the affluent Beau Richmond (John Hamilton) has decided to invite a group of friends to his home on Heron Point for a ghost hunt. Siblings Ann and Josh Carroll (Lorna Gray and Kirk Alyn) are among the invited, but they experience some car trouble along the way. Luckily, they run into a friendly mechanic (Peter Cookson) along the way, and he gives them a lift. After their arrival, the gathering is met with some brief success until Richmond drops a bombshell: while he is planning a ghost hunt, he didn’t exactly send out any invitations. Before long, Ann (who eventually becomes the title character) also claims to have seen a mysterious figure prowling about, thus setting the appropriate mood for a night full of spooky encounters. None of this seems to particularly faze the group, as they proceed with their ghost hunt. In one of the film’s more effective scenes, they creep about an impressive set that features the shipwrecked hull of an old pirate ship. According to the local lore, the ghost of a pirate roams about, and, stunningly, it seems to materialize just before one of the girls suddenly keels over from an apparent stabbing. This is the inciting incident that sets The Girl Who Dared in motion, with the whole ghost hunt acting as a pretense or a red herring for what quickly becomes a standard issue murder mystery, albeit one that moves at a rapid clip. Few seconds of its 53 minute runtime are wasted, as everything from the subplot involving some stolen radium to the various romantic entanglements (the slain girl has been involved in a rocky marriage and has been hit on by one of the other guests—scandalous stuff!) play a role in developing a fairly complicated plot. That said, it’s not quite intricate or graceful: business really picks up because Ann has a convenient dream, and suspicion is mostly bred by everyone pointing fingers at each other. When the friendly mechanic from earlier shows up and begins to act suspiciously (he disables every vehicle in the joint), it’s an obvious bit of misdirection, but it at least pays off in somewhat intriguing fashion (the movie turns on a dime once you realize why he’s really stalking about the place). 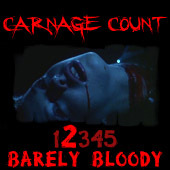 For the most part, it moves quite briskly once everything begins to coalesce—it’s an understandably talkie affair, but it’s also littered with some grisly discoveries (another corpse pops up along the way). The film is perhaps pretty inert as a pseudo-slasher, as the unseen killer doesn’t seem to be too concerned with knocking off the rest of the guests as much as he is covering his tracks (though this makes a lot of sense once everything’s wrapped up). As a pulp yarn, it successfully unspools a wild tale that remains light and frothy as it twists and turns through underground tunnels and fog-shrouded forests. It’s a delightful little romp with some clever revelations and climaxes with a silly scene where the group attempts to snuff out the murderer from their midst by using radio signals and possibly radiated blood (imagine a more quaint take on the blood test from The Thing). Despite its obvious familiarity, it bounds with energy thanks to its cast; Gray is especially spunky and a real treat since she refuses to just become a damsel in distress. As the title suggests, she dares to actually try to solve the movie while everyone else bickers, and one might say the role is rather daring considering the era’s gender norms. The film seems to be especially cognizant of these when it ends on a comical note that denies the “square-jawed hero clutches the eye-batting dame” bit that typically shuttled audiences to the “The End” card. Surrounding Gray is a capable cast of serial actors, with Alyn being especially noteworthy since he’d go on to portray Superman a few years later (coincidentally, co-star Hamilton wound up playing Perry White in The Adventures of Superman when George Reeves donned the cape in the 50s). Unfortunately, the film doesn’t seem to be as interested in subverting ethic norms, as Willie Best is once again relegated to cringe-worthy comic relief as the overly-spooked butler (luckily, it’s not nearly as bad as his turn in The Monster Walks, if only because there’s no insinuation that he’s descended directly from an ape). The title here may also seem a little ironic since the film really isn’t all that daring—it’s just another Old Dark House movie at heart, even if it is nice and polished. Republic Films sometimes functioned more as an assembly line rather than a movie studio, but its products were fine if not sometimes unremarkable, which is the case here. Many of them also come off as Lewton-lite, including several chunks of this offering, particularly during its fleeting supernatural slant; one of its jolts (the brief shot of the man lurking outside) also owes a lot to the Lewton playbook (unsurprisingly, it’s also really effective and even a little skin-crawling). 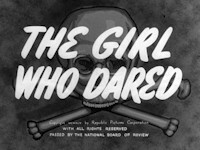 Like a lot of its Republic brethren, The Girl Who Dared has found refuge on Netflix Instant, where it’s been done justice with a nice restoration that keeps it from looking like a creaky public domain offering. As the studio literally produced over a thousand films during its run, I imagine there are more like this waiting to be unearthed (some, such as The Lady and the Monster, have come and gone from the service, which is a bummer). Unless someone gets ambitious and decides to throw together some collections for these films, this is the best we’ve got, and that’s better than nothing. In fact, it might even be for the best. Rent it!